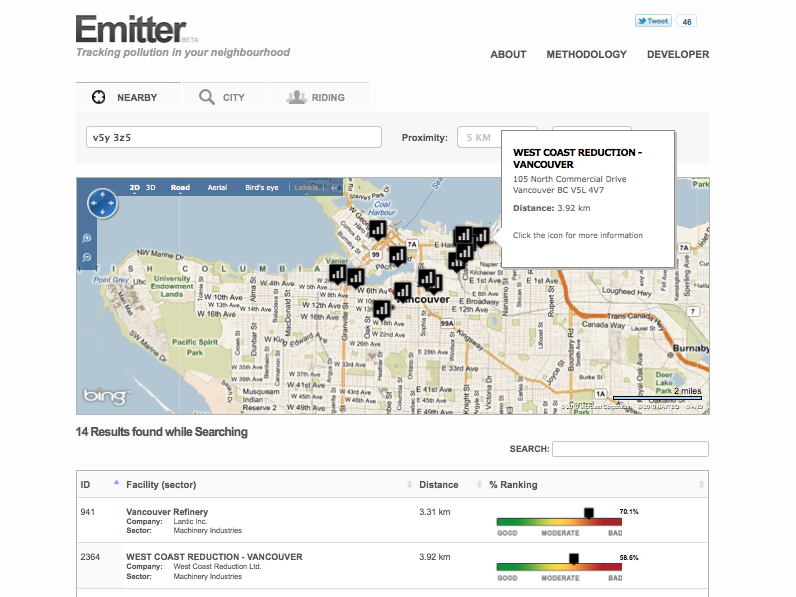 This week, I’m pleased to announce the beta launch of Emitter.ca – a website for locating, exploring and assessing pollution in your community. Having looked over the slim pickings of open federal data sets – most of which I saw while linking to them datadotgc.ca – I remembered one: Environment Canada’s National Pollutant Release Inventory (NPRI) that had real potential. With NPRI I felt we could build an application that allowed people and communities to more clearly see who is polluting, and how much, in their communities could be quite powerful. A 220 chemicals that NPRI tracks isn’t, on its own, a helpful or useful to most Canadians. With the help of a crew of volunteers with knew and who joined us along the way – Matthew Dance (Edmonton), Aaron McGowan (London, ON), Barranger Ridler (Toronto) and Mark Arteaga (Oakville) – Emitter began to come together. There are still bugs, we’d love to hear about them. Let us know. We’d like to refine our methodology. It would be great to have a methodology that was more sensitive to chemical types, combinations and other factors… Indeed, I know Matt would love to work with ENGOs or academics who might be able to help provide us with better score cards that can helps Canadians understand what the pollution near them means. More features – I’d love to be able to include more datasets… like data on where tumours or asthama rates or even employment rates. I’d LOVE to do mobile, to be able to show pollution data on a mobile app and even in using augmented reality. Finally, we have made everything we’ve done open, our methodology is transparent, and anyone can access the data we used through an API that we share. Also, you can learn more about Emitter and how it came to be reading blog posts by the various developers involved. Nik writes about the technology behind emitter. Obviously the amazing group of people who made Emitter possible deserve an enormous thank you. I’d also like to thank the Open Lab at Microsoft Canada for contributing the resources that made this possible. We should also thank those who allowed us to build on their work, including Cory Horner’s Howdtheyvote.ca API for Electoral District boundaries we were able to use (why Elections Canada doesn’t offer this is beyond me and, frankly, is an embarrassment). Finally, it is important to acknowledge and thank the good people at Environment Canada who not only collected this data, but have the foresight and wisdom to share make it open. I hope we’ll see more of this. Will Emitter change the world? It’s hard to imagine. But hopefully it is a powerful example of what can happen when governments make their data open. That people will take that data and make it accessible in new and engaging ways. I hope you’ll give it a spin and I look forward to sharing new features as they come out. Hanneke Brooymans of the Edmonton Journal wrote this piece which was in turn picked up by the Ottawa Citizen, Calgary Herald, Canada.com, Leader Post, The Province, Times Columnist and Windsor Star. Burke Campbell, a freelance writer, wrote this piece on his site. This entry was posted in cool links, open data and tagged apps, data, datadotgc.ca, environmentalism, microsoft, open data, opendata, pollution on November 12, 2010 by David Eaves. Kate Dubinski from the London Free Press has also written the an article which made the front page (so I have been told). If you’d like to help us translate it to create a French version that would be great! Sorry, I won’t be able to help you. On another matter but still pertaining to Open Data, have you ever seen Lobby Lens from Australia (http://team7.govhack.net.tmp.anchor.net.au/)? Very spectacular. I think they used the Pearltrees software. I would be interested to know what mechanisms exist for improving the site’s UI or documenting its needs are now that the hard work of getting the beta out is done. Public bug/issue tracker? This is a great new resource for Canadians. In the US http://mapecos.org/ provides some similar data. I don’t know either web site or data source well but perhaps there are opportunities to collaborate or at least promote each other. Under the title, “Neigbourhood polluters at your fingertips”, Emitter.ca was the lead article in the Friday, Nov 19th print edition of The Oakville Beaver. I can’t locate an electronic copy, but I am directing my anti-polution activist friends to emitter.ca and to this page.